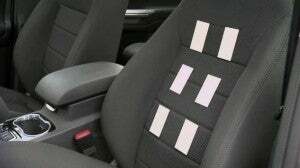 Strips on the seat could monitor your heart rate. Ford Motors has announced a collaboration with Microsoft, Healthrageous and BlueMetal Architects to bring health monitoring into cars, an effort that signals the company’s intent to move away from the in-vehicle "infotainment" systems some auto makers announced at CES. Ford is trying to change the paradigm of SYNC, which is viewed as primarily an infotainment system. Ford wants to show that in-vehicle technology can be used for tasks other than finding your favorite radio station or checking your Facebook status. Gary Strumolo, Ford’s manager of infotainment, interiors, health and wellness, told PCWorld that Americans spend about 500,000,000 hours per week commuting. Because cars are such a big part of our lives, Strumolo believes it's important to ensure that the time spent in our cars is not wasted. Many people suffer from chronic health conditions -- far more, in fact, than are involved in serious automobile accidents during their driving careers. And not monitoring chronic health conditions, such as diabetes, can actually be a driving hazard. "Think about what happens when someone with diabetes goes into hypoglycemic shock," Strumolo said. "They get dizzy, they're confused, their vision is blurred -- it's a bad situation even if you're just sitting in a regular chair, and it's much worse if you're driving a car. But if your car can monitor your diabetes for you, and prompt you to get food when your blood sugar is dropping, you can avoid this situation." Ford showed off a prototype of this future health system, developed by BlueMetal Architects, at CES. The system will be able to capture biometric data from devices such as pacemakers and glucose monitors, and will also be able to accept voice input from the driver. For example, the driver can tell the system what pills he or she has taken so far. The system will then upload this data to the HealthVault cloud provided by Microsoft, and transferred to Windows Azure to be processed with other health data. Once the driver leaves the vehicle, they'll be able to access graphs and reports based on this data. When asked if he thought this was a good idea -- bringing more potentially distracting technology into cars -- Strumolo responded like other carmakers: "People want to be connected. They're going to be connected. Our job is to make sure that they connect as safely and responsibly as possible when they're inside a vehicle."